Rothco Emergency Orange EMT Bag - 600D Polyester With PVC Coating, Eight Pockets And Pouches, Adjustable Shoulder Strap | BUDK.com - Knives & Swords At The Lowest Prices! 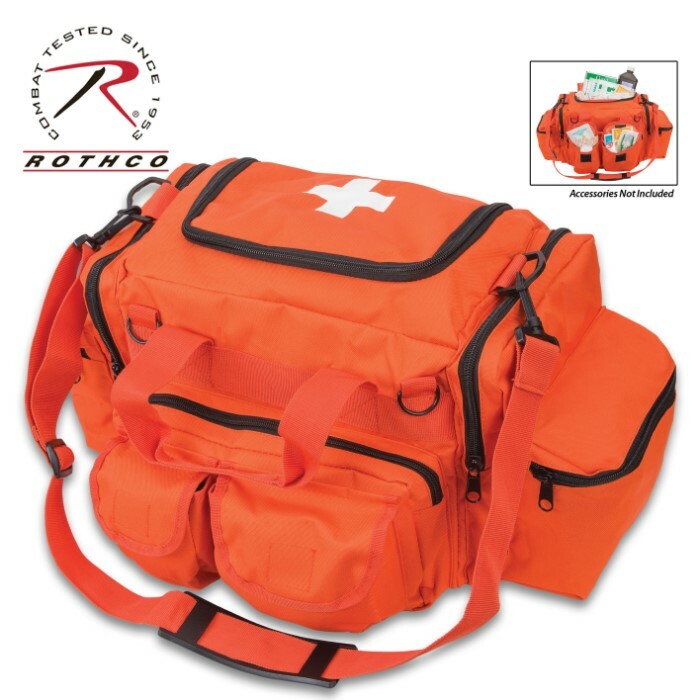 The bright orange bag is made with a durable 600D polyester material with a PVC coating and it measures 22"x 11"x 11 1/2"
Rothco’s Emergency Orange EMT Bag is perfect for emergency personnel to keep medical equipment and gear well organized, when out on the job. The rescue bag features eight pockets and pouches, including a large main compartment (12”x 8”x 11”) with a removable compartment organizer, two large side zipper compartments, two zippered side pockets, a front zippered compartment, two front pouches with hook and loop closures and D-rings. 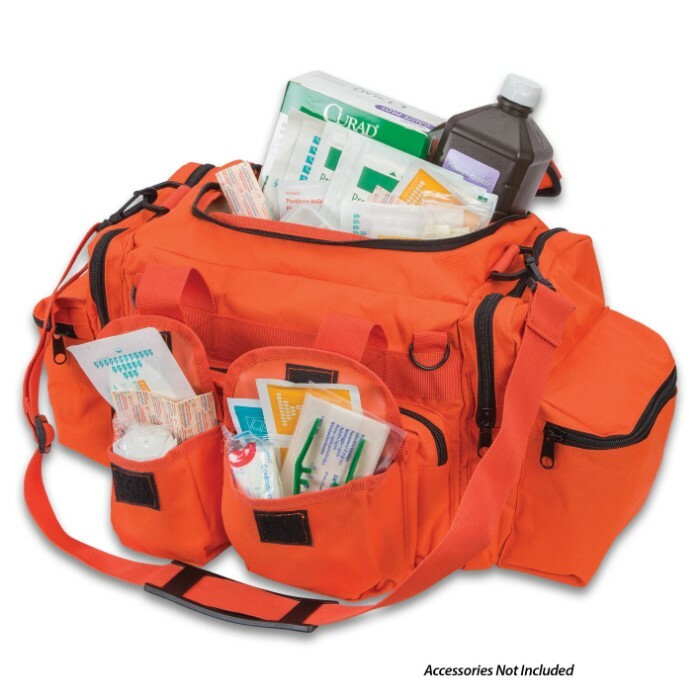 The emergency supply bag has been designed with a U-shaped zipper flap opening, which allows for easy access to equipment and supplies. For ease of carrying, the bag is equipped with an adjustable and removable shoulder strap and top carry handle. In addition, the Rothco Emergency Orange EMT Bag features a rear six-loop bandolier for attaching additional gear. 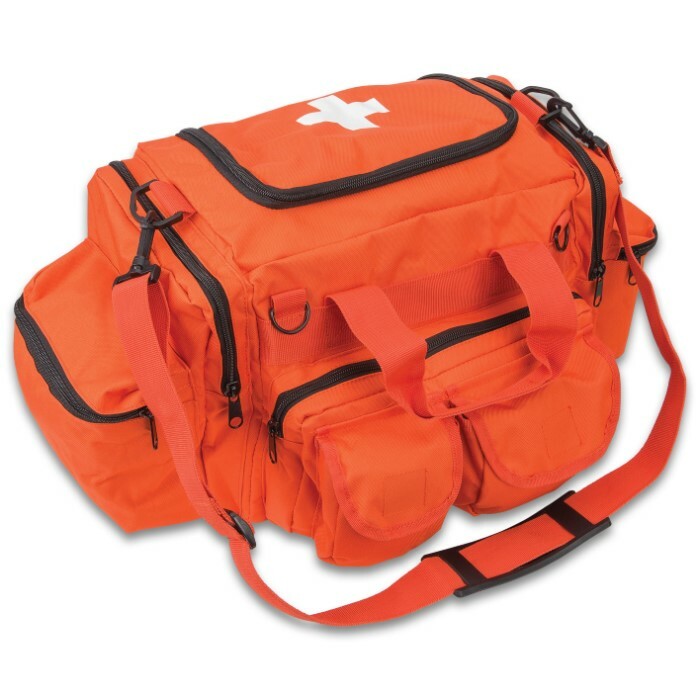 The emergency bag is made with a durable 600D polyester material with a PVC coating and measures 22"x 11"x 11 1/2".